The eighth in this series of Annals volumes brings together clinical and basic science researchers from several disciplines in a common forum to address various approaches to neuroprotection. Topics covered include the following: clinical implications of neuroprotection -- intensive care and comorbidities; anesthesia hazards -- opportunities for neuroprotection; resistance to cell death; nanotechnology; neuroprotection in spinal cord injury; and global brain injury. 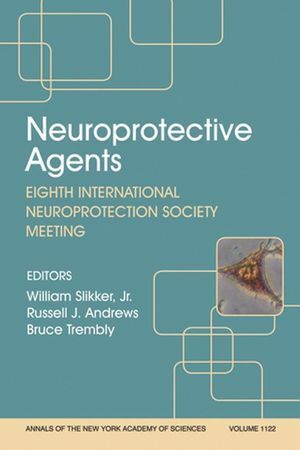 William Slikker Jr is the editor of Neuroprotective Agents: Eighth International Neuroprotection Society Meeting, Volume 1122, published by Wiley. 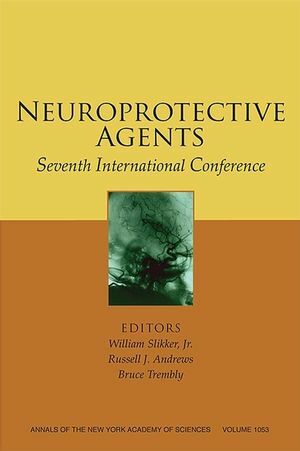 Russell J. Andrews is the editor of Neuroprotective Agents: Eighth International Neuroprotection Society Meeting, Volume 1122, published by Wiley. Preface: William Slikker, Jr , Russell J. Andrews, and Bruce Trembly. Part I: Pathophysiology of Nervous System Insults:. 1. Chronic Hypertension Aggravates Heat Stress Induced Cognitive Dysfunction and Brain Pathology: Dafin F. Muresanu and Hari S. Sharma. 2. The Brain as Target for Inflammatory Processes and Neuroprotective Stratagies: Stephen D. Skaper. 3. Genetic and Hormonal Regulation of Tryptophan-Kynurenine Metabolism: Implications for Vascular Cognitive Impairment, Major Depressive Disorder and Aging: Gregory F. Oxenkrug. 4. Metabolic Syndrome in Drug Abuse: Asraf Virmani, Zbigniew K. Binienda, Syed F. Ali and Franco Gaetan. 5. Early Exposure to General Anesthesia Causes Significant Neuronal Deletion in the Developing Rat Brain: H. Nikizad, J-H. Yon, L. B. Carter and V. Jevtovic-Todorovic. 6. Inhibition of T-type Calcium Current in the Reticular Thalamic Nucleus by a Novel Neuroactive Steroid: Pavle M. Joksovic, Douglas F. Covey and Slobodan M. Todorovic. Part II: Neurotrophic Factors and Neuroprotection. 7. A Select Combination of Neurotrophins Enhances Neuroprotection and Functional Recovery Following Spinal Cord Injury: Hari Shanker Sharma. 8. Intracerebroventricularly-Administered Neurotrophins Attenuate Blood-Cerebrospinal Fluid Barrier Breakdown and Brain Pathology Following Whole Body Hyperthermia: Hari Shanker Sharma and Conrad E. Johanson. 9. Role of Brain-derived Neurotrophic Factor in Neuronal Survival and Behavior-related Plasticity: Robert H. Lipsky and Ann M. Marini. 10. Neurotoxicity of the Human Immunodeficiency Virus Type 1 Protein gp120 in the Rat Nigro-Striatal System is Prevented by Brain-Derived Neurotrophic Factor: Italo Mocchetti, Rachel L. Nosheny, Gianluigi Tanda and Edwin M. Meyer. 11. Induction of the Neurotrophic Factors, GDNF and BDNF Associated with the Mechanism of Neurorescue Action of Rasagiline and Ladostigil: New Insights and Implication for Therapy: Orly Weinreb, Tamir Amit, Orit Bar-Am, and Moussa B. H. Youdim. Part III: Nanotechniques and Neuroprotection:. 12. Neuroprotection at the Nano Level – Part I: An Introduction to Nanoneurosurgery: Russell J. Andrews. 13. Neuroprotection at the Nano Level – Part II: Nanodevices for Neuromodulation - Deep Brain Stimulation and Spinal Cord Injury: Russell J. Andrews. 14. Drug Delivery to the Spinal Cord Tagged with Nanowire Enhances Neuroprotective Efficacy and Functional Recovery Following Trauma to the Rat Spinal Cord: Hari Shanker Sharma, Syed F. Ali, W. Dong, Z. Ryan Tian, R. Patnaik, S. Patnaik, Aruna Sharma, Arne Boman, Per Lek, Elisabeth Seifert and Torbjorn Lundstedt. 15. Treatment of Neurodegenerative Disorders with Radical Nanomedicine: Neeraj Singh, Courtney A. Cohen and Beverly A. Rzigalinski. Part IV: Additional Approaches to Neuroprotection:. 16. Neuro- and Cardio-protective Effects of Blockade of Nitric Oxide Action by Administration of Methylene Blue: Lars Wiklund, Samar Basu, Adriana Miclescu, Per Wiklund, Gunnar Ronquist and Hari Shanker Sharma. 17. The Effect of Methylene Blue and Related Redox Dyes on MAO Activity, Rat Pineal N-Acetylserotonin, Melatonin, and Related Indoles Content, and on the Righting Reflex in Melatonin-primed Frogs: G.F. Oxenkrug, S.O. Sablin and P.J. Requintina. 18. The Effect of Methyl Derivatives of Dopamine on TNF-alpha and Lipid Peroxidation: Mary C. Perianayagam, Pura J. Requintina, Bertrand L. Jaber and Gregory F. Oxenkrug. 19. Valproate and Acetyl-L-Carnitine Exert a Preventive Action on Methamphetamine-induced Behavioral Sensitization in Mice: Roberto Coccurello, Antonio Caprioli, Orlando Ghirardi and Ashraf Virmani. 20. N-Acetylcysteine Attenuates Arsenite-Induced Oxidative Injury in DRG Explants: P.L. Chao, Y.H. Chou, C.H. Yang and Anya M.Y. Lin. 21. The Effect of Luzindole and other Melatonin Receptor Antagonists on the Iron- and Lipopolysaccharide(LPS)-induced Lipid Peroxidation In Vitro: Pura J. Requintina and Gregory F. Oxenkrug. 22. Antibodies to Serotonin Attenuate Closed Head Injury Induced Blood-Brain Barrier Disruption and Brain Pathology: H.S. Sharma, R. Pataik, S. Mohanty, A. Sharma and V. Prasad.